In Autumn 2011 I wrote a short article in conjunction with an invitation to be part of a round table discussion at 3as Jornadas de la Bicicleta Pública, which took place from 13-16 October 2011 in Santander, Cantabria, Spain. 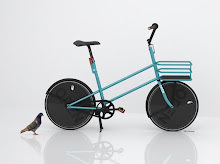 "Angelica, Torera and Juan -Public bicycles in Europe, sometime in the middle of the first half of the 21 Century” was published in May in Spanish as "Angélica, Torera y Juan. Bicicletas públicas en Europa, en algún momento de la primera mitad del siglo XXI"in the book Balance General de la Bicicleta Pública en España by Esther Anaya and Albert Castro and published by Fundación ECA - BUREAU VERITAS. This Spanish-version is available at this link in ISSUU format. 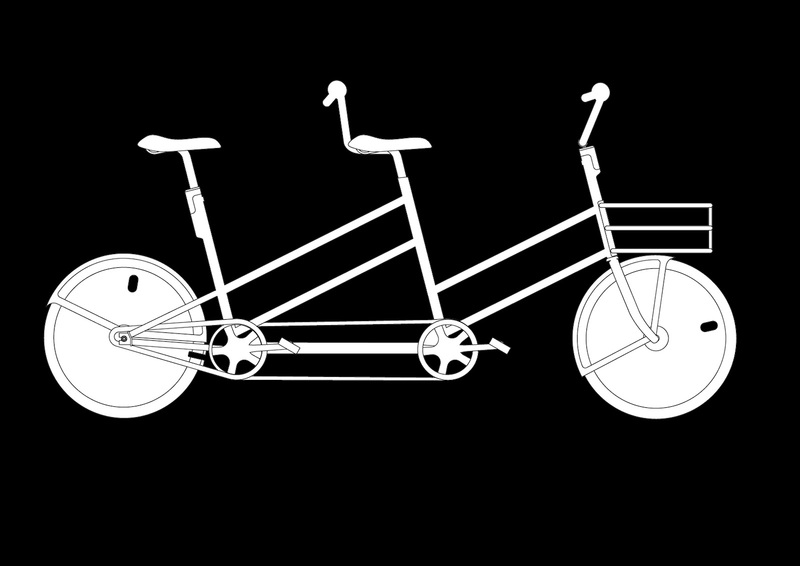 Version of bicycle from OPENbike I did for a presentaton in April 2010 for the OBIS European Bike Share Project. Slow Factory (Green Idea Factory at the time) collaborated with LOTS Design and Koucky & Partners on OPENbike, which won one of two first prizes in the Copenhagen Bike Share Design competition in 2009. There are bicycle designs that allow mobility-challenged persons - those without the full use of their legs, who have problems balancing, sight or hearing issues, seizures, etc. - to participate in physical activity and social interaction or even to have independent mobility... even in the city. For the individual with sufficient vision or hearing, a handcycle (without full use of legs) or tricycle (balance issues) might be a solution (the elderly mother of a friend of mine who has an artificial leg uses a normal pedelec/electric-assist bike). 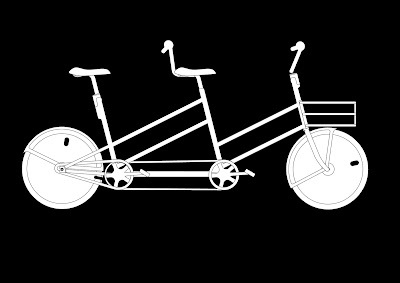 For persons who for whatever reason cannot ride alone, a tandem bicycle - for use with a friend or assistant - might be a solution*. 1 - Add something to the software/user data that allows a normal bikeshare member to use tandem bikes only if they have a doctor-certified reason for not being able to ride their own bike (vision-impairment, balance issues, unpredictable seizures, etc). This person would check out a bike on their account and travel with any sighted person, and would be liable for both (or if the bike share operator is really uptight then this person's normal assistance person, if any, but that might violate at least the spirit of ADA). 2 - There would be a limited number of these and probably adding a reservation feature would be difficult to add to the software, so no guarantee that one will be found. (However, the pricing plan for these users could enable them for longer for no additional cost in order to enable a round trip journey with a short appointment/time spent at destination). 3 - If there is an over-capacity of tandems or simply a lot of them provided, they could be available for anyone at a higher price or the normal price if both people are users (software). 4 - As many vision-impaired people have guide dogs, there is also no technical barrier to adding sidecars to a tandem. In this bit of speculative mobility fiction* I consider the growing integration of the “mobile urban lifestyle” in Europe – and it is probably carfree as well but I am not explicit it. Utopias are fine and dystopias are somehow just as easy to describe, so I try to mix the two – that is what life is like and will always be like for most people. “Public bicycles” are also not an island unto themselves and beyond integration with collective PT they are also indivisible from the political and social reality of the now and future worlds. * Note that some of the information in footnotes is also the result of consultation with a fortune teller. It was destined to be an interesting day for Angelica, the vice-president for business development at a European public transport operator headquartered in Istanbul and Madrid – she was based in the latter. But she did not know how it would turn out. The suggestion that public transport companies become complete mobility providers was pushed by UITP starting in the 2010's1, and while there were a few examples of this type of philosophy such as in Bordeaux, France2, by that time and a few more later in the strategies of PT operators, it took some time – many years - before it was reflected in tenders. And still, many were limited to focus only on varied collective modes, rather than including both motorized and non-motorized individual transport solutions. This tender was a gift for a relatively radical thinker like Angelica, and to prepare for it she did extensive research of inhabitants of the hilly areas in the mandated catchment area of the PT hubs that were the subject of this tender. What she found was not surprising for her at least: People wanted to have a variety of options to and from their homes to the hub, and to also vary them for individual journeys, in other words many loved the idea of cycling to a station and taking a bus or taxi back. Or the reverse, as long as the way home was on an electric bike. The clincher for Angelika – what finally and absolutely convinced her – was the EU-law which had recently come into effect that mandated a guaranteed minimum lifespan of electric bikes – specifically, it standardized both battery connections3 and mandated that future upgrades would be low-cost. Somewhat ironically, this legislation was the result of an early EU-law that banned cadmium4. This came after lobbying from Brazil after the Brazilian Space Agency discovered what was eventually called lunaterium – a cheap and safe version of its toxic Terran cousin – on the Earth's closest neighbor. The low-cost lunaterium helped expand the pedelec market but this also meant a lot of cheap bikes were built. Her solution and her company's bid was to provide pedelecs (with support infrastructure) buses and taxis (the latter which could also be shared). There would be three price levels (bike or bus/shared taxi/private taxi) all of which would be tied into a smart card/NFC device for residents of the area. As far as she knew, only her company was proposing bicycles as part of a solution. Would her company's bid be successful? She found it hard to wait for the answer. As she exited, she was nearly hit by a someone on a bicycle. “Hey, stop!” she yelled, not really loudly as the cyclist was not going so fast – he turned around, looking a little embarrassed. “Do you know you're not supposed to ride on the pavement here?” she asked of him. Torera walked around the corner and saw three bikes parked on the pavement, three “Touch-Bicis” – which most people just called “Touch” for short. Which bike was hers? It did not matter: The system only told her that at least one bike was available at a particular location. If she touched her NFC mobile phone9 to any bike with a green blinking light it would become hers10. He arrived early in the morning. There it was, just as he expected, a three-wheeled pedelec11 . Juan, a lawyer specializing in electronic privacy, moved from the platform area of the Brussels South train station – he had just arrived from Catalonia via Paris. Using his NFC-equipped phone he released the lock on his bike and then placed his bag in the cargo basket and also his crutches.. He recalls visiting the “Capital of Europe” a few years before and having to rent a normal bike instead of being able to use either of the city's bike share systems. This was complicated but he could talk to the staff and get some advice on riding around the city. 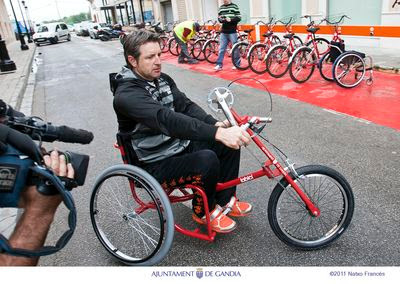 The staff was also curious but respectful about how he cycled around considering that he had muscular dystrophy. He took the familiar route to his hotel and locked his bike in front. He put his bag on his back, grabbed his crutches and went into the hotel. He bypassed the reception and went straight to his room, opening it with his phone12. He put down his bag and laid down on the bed for rest. “Hmmm, all the way to my hotel room and haven't spoked to a soul,” he thought, before dozing off. He had no idea how to get to the European Parliament and while he could use Google SuperEarth on his phone, he decided to do it by feel13. He had used this system before in other cities, but as he found out later in Brussels it did not seem as finely-tuned, e.g. in regards to hills: It did not indicate a turn far enough in advance – this would save both physical and mental effort if one knew they had to turn before a big hill, or when they had to turn whilst going down one. At the EP he met the assistant to MEP Ivana Bicicenko, with whom had an important discussion scheduled. In recent years more and more seamless mobility systems around Europe had removed the possibility for anonymous use (e.g. using paper tickets, paying the driver etc.). While this generally made things easier and cheaper for both customers and operators, the supposedly secure data was in a few cases “accidentally” leaked by operators but in quite a few more was hacked, and often maliciously. MEP Bicicenko was speaking to Juan in regards to the backlash against “NFC-ism” as it threatened the goals for use of every type of mobility except for walking, riding one's own bike, and private driving of automobiles. “When one size doesn't fit all – What you need to know about e-bike charging interfaces.” - Cycling Mobility issue 1/2011, June 2011. Toxicity of Cadmium – http://es.wikipedia.org/wiki/Cadmio#Toxicidad_del_cadmio. Before lunaterium, cadmium became the subject of use restrictions that eventually made its use in private urban automobiles very, very expensive, one of the main reasons that private car use in EU cities had dropped an average of 2% per year since 2012. As liquid fuel prices also had risen significantly, private urban car use never went back to 2011 levels. “NFC” stands for Near Field Communication, communication technology to wirelessly at short range and at a high frequency that enables data exchange between devices less than 10cm apart. (Source: Wikipedia). In the mid-2010's after the introducion of new, perfected “floating public bicycle” systems (without fixed stands), the on-street, location-fixed, single-company facilities of “3rd generation bike share” were determined by EU lawmakers to be a monopolization of public space (unlike e.g. bus stops or railway platforms, all of which could serve different mobility providers). Bike share operators rejected sharing the fixed stands; the result was that fixed facilities – with the exception of locations such as railway hubs - were made illegal in EU/EEA countries. From then on what came to be called “individual, self-powered, optionally-motorized public transport” or ISOPT, had to be based on “floating” architecture. 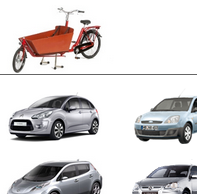 “Liking Cycling and Bike Striking”, Cycling Mobility blog, 4 July 2011. (Unfortunately, Cycling Mobility magazine ceased publication at the end of 2011 and deleted their website). Hats off to these awesome cycling article. Hope to read more of your worthwhile blogs.